Intent: To establish the viability and management practices of “small flocks” of laying chickens (layers), on seasonal pasture, free roaming except at night. 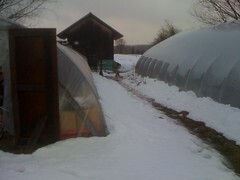 Capital Investment; North Slope Farm. Daily Management; North Slope Farm. Site Details; infrastructure and fields managed by North Slope Farm. Enterprise; 3 total flocks of 50 birds each, annually. Each year 50 new chicks will be started and at the end of the season the oldest flock will be retired. Each flock will yield 2 seasons of production, over a managed lifespan of 3 seasons. Flocks will be managed according to Generally Accepted Organic Practices, with a focus on access to outdoors, and Organic Feed. Ideally investment dollars will be directed to local businesses, ie; feed from Rosedale Mills in nearby Pennington, NJ. Chicks currently purchased from Moyers Chicks, in Quackertown, PA, due to past business and good reputation. Regular records will be kept of costs and production. North Slope Farm will be responsible for costs and income of the operation. Information about the project, including annual summaries, will be shared on our website under Special Projects; Poultry. Farm manager and trainees currently manage two flocks of layers. The ‘08’s have been retired from production, so the ‘09’s are the “old girls” now. 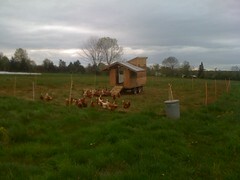 The 210’s (chicks started in 2010) are out of their baby pen, into the big girl housing but not yet on pasture. 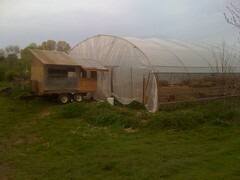 Their coop is built into a fenced yard for the winter, so they will not be on pasture until Spring 2011. They are first in line for special treatment though – vegetable waste from market garden as well as hay and sprouted grains for scratch. 2010 was hard on the field girls with serious losses to foxes. We anticipate increased pressure as cold weather sets in. To avoid loses over the winter we need to enclose the girls, ideally into a large greenhouse, but at least a fenced yard. The winter setting for the 2010’s is established but where we’ll park the 09’s is still up for debate. Getting them into a situation where we can build extra protection from the winter extremes is the priority. Also critical is to have them near to our winter water source. The costs of the enterprise are primarily in Feed. Labor is the other major item. The labor required at minimum is Morning and Night. The opening of their coop in the morning, freshening bedding, filling feed and fresh water. Evening chores include closing coop, securing feed and collecting eggs. We typically visit the coops up to three times a day, collecting eggs and checking feed and water in the afternoon. Each week the field coops are moved to a new section of pasture. The section of pasture has a perimeter of 330’ as defined by two 165’ lengths of “Poultry Net” (from GrowersSupply.com) – Cost at purchase $170 each. We sort the eggs into Market (clean from coop) and Farmer (needs cleaning). The farmer eggs are available to our trainees (and community investors) at reduced cost. The Market eggs are rinsed prior to packing and selling each week. Current average yield for thiry layers is 13 market dozen per week, at $4.50 – about $60 for a weeks worth of tending (not enough even to support a workers responsibilities at $10/hr). The goal will be two flocks of 50 each, yielding 43 doz, or $190 for a weeks worth of tending. The working assumption is that more birds than that would exceed our ability to manage optimally. Future discussion: Establish a viable wholesale cost. Assess production management; strengths and weakness. Assess production potential and identify limitations to operation. Identify values and costs of enterprise not reflected in hard data collected. Special Projects are how we allow for interests and opportunities that fall outside our set practices. Individual trainees can design their own special projects or like with our Poultry Project, the farm manager might define a production effort as a special project until it proves itself over time. Winter Production and ‘TableTop Greens’ are other examples of this.